Did you know that the Denver Temple currently houses a Nokotsudo (columbarium)? A Nokotsudo is a special area for the storage of ashes of loved ones. Urns are placed in individual niches. There is an altar within the nokotsudo where family members may offer incense and flowers in a quiet setting. As a Temple member, you may choose the Nokotsudo as your final resting place; as a Temple family, you may choose the Nokotsudo as your final family gathering place. Temple members may reserve niche(s) immediately so that the space is available when needed. The Nokotsudo Committee members have carefully considered and discussed the many aspects of purpose, procedure and continuity of housing a Nokotsudo. Your decision to commit an eternity in the Nokotsudo no doubt creates many more questions than can be answered in a single newsletter article. Fortunately, each committee member is dedicated to providing you with information and forward-thinking ideas. They will continue to disburse information through mailings, Sunday service announcements, newsletter articles and Sodan (funeral planning) meetings. Meanwhile, you are encouraged to take the initiative and reach out to individual committee members – each is available to meet with you privately and at your convenience to discuss your options. The nokotsudo is a special area for the storage of ashes of loved ones. 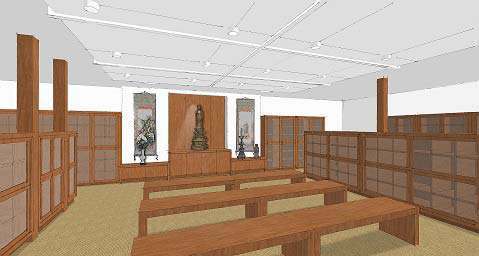 The nokotsudo is being built by generous donations of Sangha members. As always, please feel free to utilize checks in person; the web payment option is offered for those who wish to use it!